Data loss is something that I wish upon no one. Those who have experienced this catastrophe already know that one occurrence can easily mess up one’s day, jack up one’s week, and quite possibly destroy one’s year. Many of us have priceless photos of those we love, places we’ve experienced, and people we’ve seen. We want to keep those photos with us for our lifetime! That’s why some of us have resorted to external hard drives to archive the lovely photos we take, right? But the right workflow matters. There are several other reasons as to why someone would off-load their photos onto external hard drives: maybe the lack of internal local storage space on the computer, maybe someone suggested it as means of backing up a computer, or perhaps it’s solely for archiving. As helpful and convenient as the inexpensive portable hard drives are, they don’t provide the safety net that is sufficient for those who really care about their photos and their data. Personally, I have lost more than 5 single external drives of various brands that I thought would hold everything I ever needed– solid state drives as well as traditional platter drives. The first four times, I was lucky enough to recover most of my photos with a minimal loss and corruption. The last time, I wasn’t so lucky. My drive contained a two-year trip to England and had photos all over from the northeast of the island– gone. My many of my film scans and digital art– gone. All my photos prior to 2011– gone. That’s when I invested in my first RAID storage system. It was a little bit complicated to set up, but it worked for a while. Now, for you, I figure that it will be better to understand the complex to be able to appreciate the simple, so here we go. RAID stands for Redundant Array of Independent Disks, and lets you group up several hard drives together to make one big hard drive, which was a pretty good option at first. Image courtesy of Western Digital. RAID 0, also called Striping, is a speed/performance enhancing mode that has zero redundancy and is dangerous to rely on as a form of archiving- In this mode, you need typically need at least two identical disks and you’ll mostly get the full formatted capacity of the combined drives. The system splits the data and writes an equal part of the data to each of the disk. When the system needs to read data from the disks, it can pull from all drives at the same time, which increases the speed at which data is retrieved. Since the part of the data is on one disk and the rest lies on the others, if any disk fails, you lose the all data across all three disks. RAID 1, also called Mirroring, is used for backing up and redundancy/fault tolerance and you need to have at least two drives. Data is written to all drives, so if one drive fails, you still have all the data on the other drives. There is no performance increase in modes like this and you end up only able to use, at most, half of the space that you pay for! There’s also a typical speed decrease, as the system needs to write the same data at the same time. RAID 5, called Striping with parity, adds a bit of fault tolerance to the RAID 0. In this mode, you have to have at least 3 of the same disks. Striping is increased to all disks, but there is a parity block written to each drive. This parity is really helpful in times when a drive fails. When it does, the system does some math magic from all the combined parity blocks written and the data gets reformed. You get performance and some safeguarding from losing all of your data. Setting up systems like this can get pretty expensive pretty fast. A regular RAID system isn’t very easily upgradable. If you have three 1TB drives in the a RAID 5 system and you need more space, you’re in for a headache and a half after your wallet takes a hit for purchasing three more identical drives that are larger in capacity and another RAID system or offloading the data somewhere else so you can reconfigure your current system. Doing all that increases the risk of data loss! I ended up using this for a bit until I realized that I couldn’t afford the time to move all the data from one built RAID 5 system to another RAID 5 system that I built with larger capacity. Then it dawned upon me that I was wasting money with the other RAID 5 box that was left unused. I also didn’t know what to do with the lower capacity drives. A slightly more complex predicament that I didn’t anticipate myself being in. Drobo understood the problem that I, among many others, was facing– mainly that I was needing a storage system that is fast, expandable, redundant and easy to set up and use. 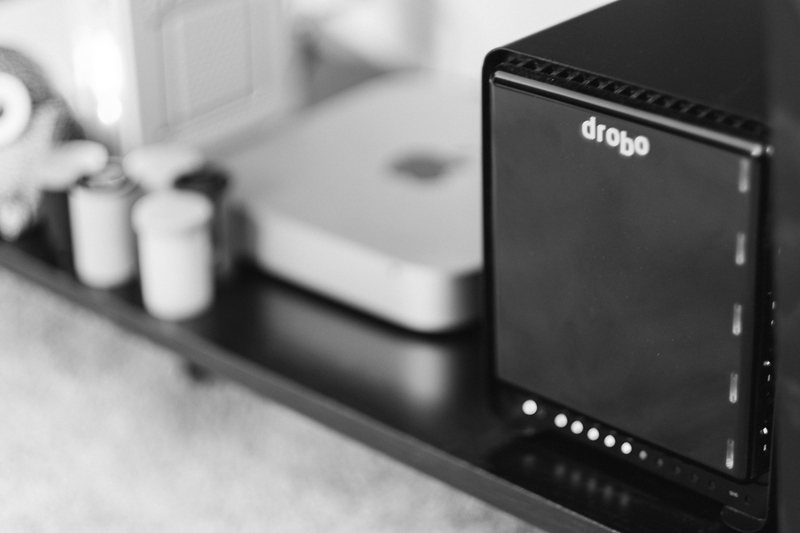 Drobo developed a method based off of traditional RAID storage that enables people like you and me to add storage with redundancy while still being able to replace failing drives without having to do any crazy configuring. You can add drives as you need to, and when the bays are all filled up, you just replace the lowest capacity drive with more capacity and Drobo will re-layout the data to that drive! This is what I mean by safe and simple. Setting up the Drobo 5D was a cinch! I just plugged in the drives with the power off, followed the instructions that led me to download Drobo Dashboard, walked through a few more directions of easy steps and I was throwing photos on it in less than 6 minutes! But what happens when your drive fails? Remember, it’s not if a drive fails, it’s when. All hard drives wear out (think of them as spinning tires on a car). The Drobo Dashboard software that accompanies the Drobo drive notified me of a failure in the device and illuminated a light to show which drive was having the issue. At that point, it was simple to pop it out, and plug in another one. Rebuilding the array was very simple, but did take a little bit of time. Once I saw all green lights, I knew I was ready to go! Sorry, but I can not agree with your point. Sure, raid systems can protect you from single drive failure in “some” cases, but I have seen raid controllers fail and write garbage to all it’s drives. If your data is valuable, then it should be stored independently in at least in two separate systems, preferably three (and one offsite). We’ve covered 3-2-1 backup multiple times on site. @Terry: Not sure how a post about RAID and written with nothing more than the desire to help people understand its value warrants a rant about 3-2-1 backup??????? Sorry, but no rant intended. I consider Photofocus.com to be equivalent to the New York Times of photo blogs. You have admirably covered 3-2-1 backup, and I felt that this post may lead some occasional readers to think that a single raid based system was a totally safe and secure data storage method. It is most useful as part of the solution, but not ALL of the solution. I do have some IT experience, and have personally seen 3 total raid system failures (not Dobro), and about 10 drive failures. 9 of the 10 drive failures were recovered with Steve Gibson’s Spinrite. None of the raid systems were recoverable, but no data was lost due to professional back up policies. Photos are important to all of us. I just modestly suggest not keep all the eggs in one basket, no matter how well built the basket is. Terry, that is why we’ve run multiple posts on 3-2-1 backup. We’re firm believers ourselves… All drives fail (its just a matter of when). Personally I use to Drobos for my photo collection. Each unit can have two drives fail without data loss. Each night they automatically mirror and backup offsite. When I import, I back up to both at the same time. Mykii’s piece is on part of the puzzle.